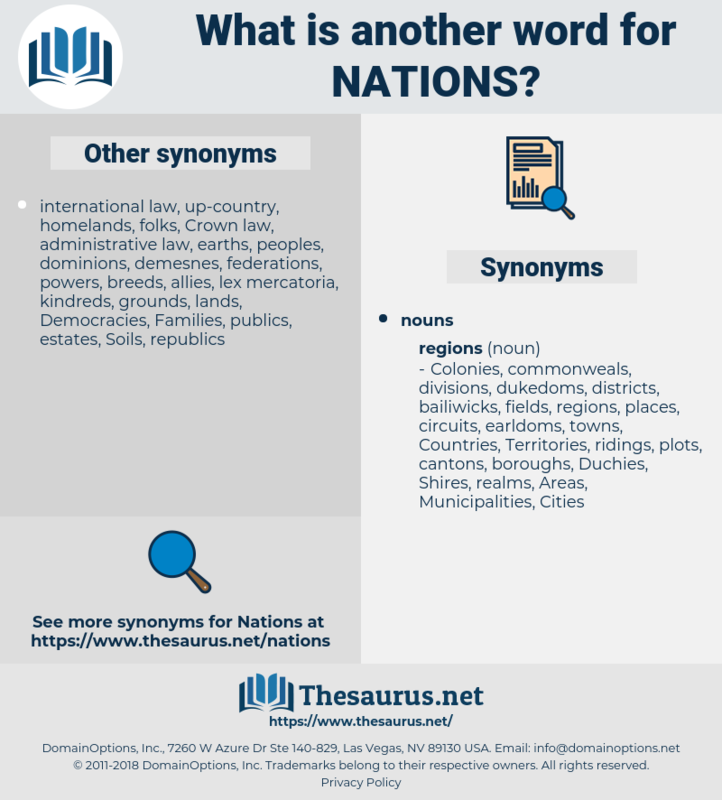 What is another word for nations? 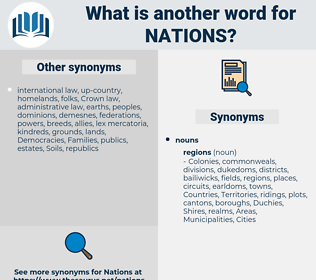 na-tions, Populations, reservations, presentations, institutions, circumstances, Consultations, Communities, cooperation, Publications, subdivisions, contributions, delegations, solutions, responsibilities, operations, Governments, Territories, conflicts, participants, resolutions, partnerships, commitments, Missions, monitoring, relations, statistics, disarmament, secretariat, secretariats, indicators, representatives, agreements, reports, Indians, technologies, north, maintenance, principles, Ecosystems, brothers, partners, priorities, arrangements, headquarters, assets, instruments, chinese, sessions, costs, gentiles, reserves, computers, Donors, Immunities, mechanisms, coordination, systems, support, mandates, Resources, Treaties, words, unies, Forests, Rights, issues, rules, protocols, list, letters, practices, accounts, UNOPS, departments, special, aids, aspects, programmes, services, projects, Goals, trends, Ideas, Freedoms, Activities, Conferences, forces, Agencies, purchases, Policies, experts, always, Miles, girls, Roles, Its, claims, *, Bodies, frameworks, +, mrs, Forms, views, heads, officers, problems, 2007, Drugs, funds, 2004, 2003, 2002, 2005, commissions, 2008, 2000, date, Refugees, committees, boards, meeting, meetings. nations-, nations-sponsored, nations-owned, Nat, nations-related, nations-wide, coordination, information, situation, na-, na, introduction, intergovernmental, on, commission, commissions, intellectual, assistance, Organizing, partnership, multilateral, humanitarian, economic, contents, progress, original, planning, us, UEN, social, authority, financing, security, asean, other, poverty, procedure, status, n., conference, annual, system, euro, de, human, labour, field, maternal, program, Programs, health, mother, Mothers, privileges, strategy, service, appendix, sept, thursday, annex, panel, to, board, iv, The, police, york, baghdad, boards, country, dole, Children, league, law, pays, From, control, /, cup, for, C, meeting, meetings, number. internationally, Populations, regions, Negotiations, institutions, situations, Communities, cooperation, jurisdictions, Religions, delegations, operations, Governments, ations, participants, Foundations, asia, relations, Societies, asian, initiatives, individuals, representatives, agreements, requirements, Indians, matters, years, ethnicities, towns, principles, citizens, millimeters, ordinary, adopted, Economies, allies, partners, benefits, documents, men, millimetres, sessions, Standards, gentiles, Entities, villages, Clients, parts, women, reserves, others, statements, Resources, Treaties, interests, unies, Cultures, groups, Rights, iraqi, issues, leaders, Areas, kosovo, french, ranks, letters, practices, trade, programmes, services, africa, Universities, projects, Goals, nuclear, chapters, charter, OECD, protocol, proposals, member, Activities, materials, Efforts, results, Agencies, Ones, data, claims, Bodies, centre, Parties, supplies, methods, needs, Forms, Schools, sides, mm, heads, problems, space, Drugs, 2003, cases, offices, assistance, asean, status, Programs, baghdad, Children, pays, meetings. Much is due to courtesy between nations. But the Roman Empire did not destroy nations; if anything, it created them. new edition, nomination, nidation, nineteen, notion, new town, neodymium, neaten, nation's, nutation, net ton, Natation, ninety-one, notation, na-dene, Naut Mi, niddm, neotony, now and then, nations', Numidian, newton, neoteny, neotoma, numidinae, newtonian, ninety-nine.